According to trends, hospitals will have to replace almost 50% of their staff every five years. On top of this, the baby boomer generation is getting ready to retire. This means that healthcare organizations will need to replace seasoned team members. Your healthcare organization wants the most qualified person to meet your executive search needs, but the competition is facing the same issues. This means it will take more than just a great salary to attract top executive talent to your healthcare organization. It is up to you and your team to make a fantastic first impression. 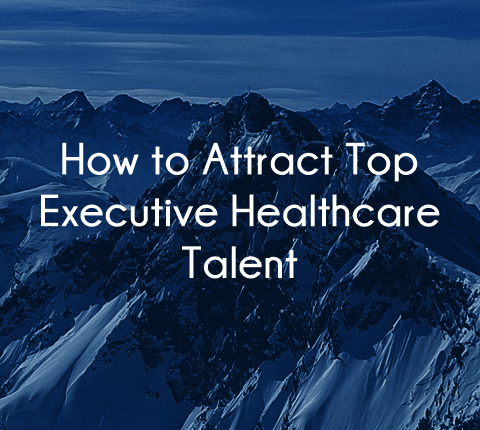 Throughout our years of assisting all types of healthcare organizations with their executive search needs, we’ve found some tactics that will make your organization more attractive to top executive talent. Today, we’ll discuss how you can attract top executive healthcare talent. These tips will not only help you to bring on the right team members, but will also help you to retain them so you can save time, money, and run your organization more efficiently. You already know that you need to offer competitive pay and fantastic health care, but so does your competition. The best way to stand out from the rest is to offer benefits that create a better quality of life for your hires. This does not mean having ping pong tables at the lunch room. Sure, these are fun, but people are looking for options that will make their life better. Think of ways to offer perks such as interest-free loans to assist with student loans, flexible scheduling, life coaches to help with transitions, parental leave for both men and women after having a child or adopting, and reduced cost child-care. These types of benefits will not only help to attract new talent but retain the talent you already have. Speaking of amazing benefits, relocation assistance is one of the most powerful tools in your arsenal. Your perfect candidate will most likely come from another part of the country. Making this transition easier on them is a sure way to make your organization more attractive to them and their family. Do some research and find out what your competition offers in terms of this perk, then go above this to stand out from the rest. If your competition offers assistance with moving costs and temporary lodging, think about working up a partnership with an agency to help their partner find work. It is things like this that make all the difference. This is no time to be humble. You need to build a strong employer brand and that means marketing all your benefits. If you offer training classes, tuition for furthering knowledge, housing assistance, and other benefits or the like, make sure that your potential hires are aware of them. All these things are an added value, and not flaunting them will be of disservice to your organization and your new hire. In order to attract top executive healthcare talent, you need to make a great first impression. Once you’ve gone through the formalities, the on-site interview is the perfect time to solidify the relationship and sell the position. This is your chance to stand out above all other potential employers and show that perfect candidate just how much better working for your medical organization will be. Go above and beyond on things that may seem small. For example, if your potential hire is coming in for an interview from out of state, arrange for a pick up from the airport. Better yet, have someone else in leadership pick them up. This is a great opportunity to build a relationship and guide the talent towards a career with your organization. For example, if the candidate is making an out of state move with family, do some research and have materials ready with information on housing, school districts, etc. If your candidate has been active in non-profit organizations at his or her current location, have information ready on similar organizations in the new area. The idea here is to customize their experience so that you can attract top executive talent. If your candidate is relocating with a spouse, children or parents, consider them in your efforts. Set up events that will allow the family to get to know the families of others in the organization. Create some time for them to get to know the families of their soon to be peers. All this will aid in adjustment and show that your company culture is robust and cares about every member of the team. A lack of follow-up can result in losing all the time investment and effort you put into that candidate. If you wait too long, your perfect candidate could be courted and stolen by your competition. Assign someone on your team to reach out with a call or personal note a day after the visit. Then, send a thank you card for a personalized touch. This will strengthen your efforts and create a positive memory of your organization as a brand. Waiting too long can allow your competition to steal that perfect candidate. You need to always assume that your candidates are being courted by other organizations. It is not just you doing research; candidates will be doing a little digging on their own when choosing the perfect work environment. This is a great reason to keep your social media accounts active and fed with posts that highlight your company culture. Social media is not just a place to share your accolades and scholarly articles, but a perfect place to share those times when your company does things to bring team members together. Whenever you host an event, take pictures and add them to your company blog and social media sites. This will only work if your company culture is authentic and your team is as enthusiastic about the culture as you are. The right executive search firm will already have a strong relationship with their candidates. They know these candidates and vet them to make sure that you are a good fit for each other; but most importantly, they can take a lot of stress out of attracting the best person for the position you are trying to fill. For example, the team at Summit Talent Group takes care of many of the items mentioned above. As a part of our executive search process, we give candidates information on the location (including all that extra work on finding a home, setting their kids up for school, etc). We have connections with realtors throughout the country to make relocation easier, and we assist with all the logistics of travel for interviews. We also conduct follow-ups to ascertain that things are running smoothly. All these things will make the process faster and more effective. If you follow these steps on how to attract top executive healthcare talent, you will show that your company culture is both proactive and thoughtful. That it is both professional and caring. This will make it much easier for physician and executive candidates to accept a position at your organization. If you’d like to speak to a member of the Summit Talent Group team about how we can assist you with your executive search needs and attract top executive healthcare talent, contact us here.